Alyssum is native to the Mediterranean where it's commonly found growing on sandy soils. This is an old-time, cottage-garden, heirloom variety of Alyssum meaning that you can save the seeds from year to year and they'll have the same growth habit and flower colour as the parent plants. Royal Carpet Alyssum is a low growing, spreading annual flower to 15cm tall that produces masses of sweetly fragrant, deep-violet to mauve coloured flowers. Royal Carpet is great for adding colour to borders and edges as it won't shade out plants behind it. Also suitable for growing in rockeries, mixed cottage gardens and containers. May overwinter and be successfully grown as a short-lived perennial in warmer climates, but grows as an annual in cooler climates. The nectar within the Alyssum flowers are a preferred food source for the adult stages of caterpillar-parasitic micro-wasps and hoverflies, the larvae of which are voracious predators of aphids. The nectar is also irresistible to small native bees and other insect pollinators. Alyssum flowers will help to attract both beneficial insect predators as well as insect pollinators to your garden and are low growing, so they make excellent, well-behaved companion plants for most garden vegetables. 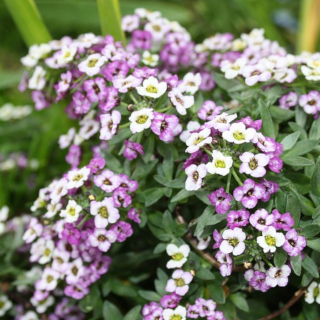 Alyssum works particularly well when planted as a groundcover under grape vines or inter-planted between lettuces. Choose a growing site for Alyssum that receives full sun for best flowering. Alyssum will also grow well in light shade but flowering may be reduced. Alyssum requires a free-draining soil to grow successfully, plant in raised garden beds if you soil is too compacted or heavy with clay. Alyssum prefers a sandy loam soil rich in organic matter, so dig lots of organic matter including well-rotted manures, compost and worm castings through your garden beds prior to sowing to improve your soil structure and provide nutrients to your growing plants. Apply a complete liquid organic fertiliser, worm juice or compost tea every few weeks throughout the growing season to encourage flowering over a long period and promote healthy growth. Alyssum can suffer from powdery mildew, this can be reduced by using drip irrigation to avoid wetting the leaves and allowing space between plants for good airflow. Alyssum grows best in soil with a mildly acidic to neutral pH, between 5.8 and 7.3. Alyssum will tolerate mild frosts. Will self-sow if conditions are favourable. Easy to grow variety. Sow Royal Carpet Alyssum seeds any time of the year in frost-free temperate and subtropical locations. In cooler regions of Australia sow once the weather warms from October to February. In tropical regions of Australia you can sow Alyssum seeds during the dry season from March to July. Alyssum can be directly sown into your garden or started in pots. Alyssum seeds are small, so surface sow them and either cover them lightly with mix or rake them into the soil gently. Thin seedlings to about 10cm apart after several weeks of growth. The majority of Alyssum seedlings will germinate within 10 to 15 days after sowing the seeds. Royal Carpet Alyssum take between 9 and 10 weeks to begin flowering. Alyssum will flower all year long once established with a more intense display during Spring. Remove spent flowers to encourage further flower.